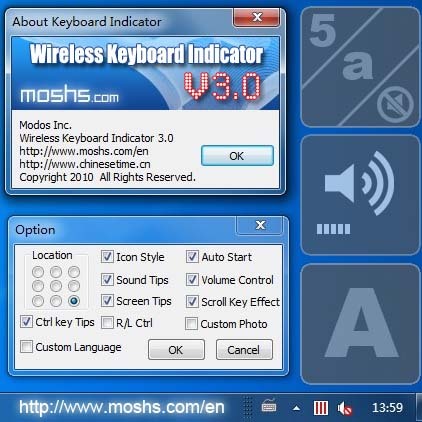 The Wireless Keyboard Indicator is a program which stays in your Windows system tray and displays “Caps Lock”, “Num Lock” and “Scroll Lock” status, allows you to switch key status, plays a sound when the key status changed and any more. Volume Control: Move mouse over windows taskbar, turn the mouse whell, you will see it. Smart Tip: Press Ctrl key one second, a tip image will show up. Location: Where to show the tip on your screen. Notice: If you want use custom image tips, please create a “skin” folder inside current folder and name the six tip pictures to be 0.bmp 1.bmp ….5.bmp,if you have nice pictures, please mail to me, I probably can use it as well. If you have any suggestion, plese let me know,thx.